A Labrador kennel, shelter or home. Which is best for your Lab? I must admit I have very strong feelings on this but hopefully this article will be relatively balanced. I was prompted to write this article after discovering a neighbour, who had a sudden fancy to become a Labrador owner, was keeping a young Lab in the back garden, starved of affection, companionship and decent living conditions. Fortunately that Lab has now been re-homed but for several days the poor animal was kept in solitary confinement without company or affection. Labrador’s are, first and foremost, housedogs. They like nothing better than to be near their owners and to spend their nights curled up asleep knowing their family is nearby. To make such a dog sleep in the outdoors with benefit of company is nothing short of cruel. Labrador’s are very sociable dogs. And some do live in a Labrador kennel environment. But, this is almost always only true of breeders or trialists who have packs of dogs. In those circumstances, as long as the Labrador kennel is clean and dry and the dog is allowed to mix and is exercised regularly than he will be OK. But, for a family dog who is a companion, please don’t make him sleep outside. Your Lab wants nothing more than to be near you. He wants a master, play mate and friend. He doesn’t want to be alone. Keeping your Lab outdoors mustn’t mean out of sight out of mind. He must have daily attention and spend quality time with you. Essentially he needs regular and proper exercise. It goes without saying that fresh water must always be provided and the area in which he lives must be fenced off; not only to stop him wandering off but also to keep him safe. His shelter must be an adequate size so he can lay down comfortably but ensure the Labrador kennel isn’t too big or he won’t be able to keep warm in winter. An outdoor Lab needs regular meals and don’t forget to wash his food and drinking bowls after every meal. 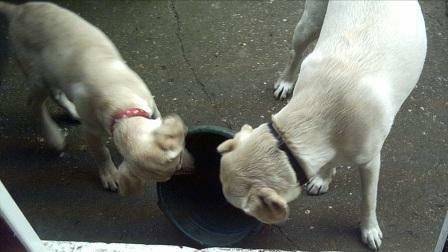 Labradors aren’t the tidiest of dogs so make sure any spilled or wasted food is picked up and disposed of. Leaving discarded food, which will turn rotten, is asking for trouble if your Lab suddenly gets the munchies. Finally, if there is nothing else for it but for your Lab to live outdoors then it is essential that he still receive all the attention and love that he would receive if he were indoors. He needs regular play, stimulation, exercise and grooming. He needs to be loved. If you can’t provide all this than a Labrador really isn’t for you.